The citizens of Washington County, Virginia gave up their sons and daughters to the Confederate cause of the Civil War. Contributing six Confederate generals as well as Union officers, the region is emblematic of communities throughout the nation that sacrificed during the war. Though the sounds of cannon fire and gunshots were only heard at a distance, Washington County was the breadbasket for Confederate armies. From the fields surrounding Abingdon to the coveted salt works in Saltville, Union Generals were constantly eyeing the region, resulting in the Saltville Massacre and the burning of Abingdon's famous courthouse. Historian Michael Shaffer gives a detailed narrative of Washington County during the Civil War, painting vivid images of heroism on and off the battlefield. Michael K. Shaffer is the assistant director/lecturer with Kennesaw State University's Civil War Center located in Kennesaw, Georgia. He is a Civil War historian who has written various articles for state and local publications. 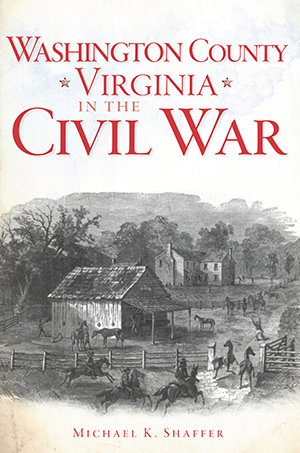 Prior to joining the Civil War Center, Michael resided in Virginia, where he assisted the Historical Society of Washington County as Civil War historian, chaired the county's sesquicentennial committee and served as the liaison between all counties in the southwestern portion of the Old Dominion and the Virginia Sesquicentennial Commission in Richmond. He has delivered various lectures on the Civil War, participated in the Barter Theatre's 360 panel discussions and remains a member of the Society of Civil War Historians and the Society for Military History. Michael holds a BA in military history, as well as an MA in military history, Civil War studies, from the American Military University.